Here’s our fantasy premier league tips midfielders GW9 article in our player rankings series. 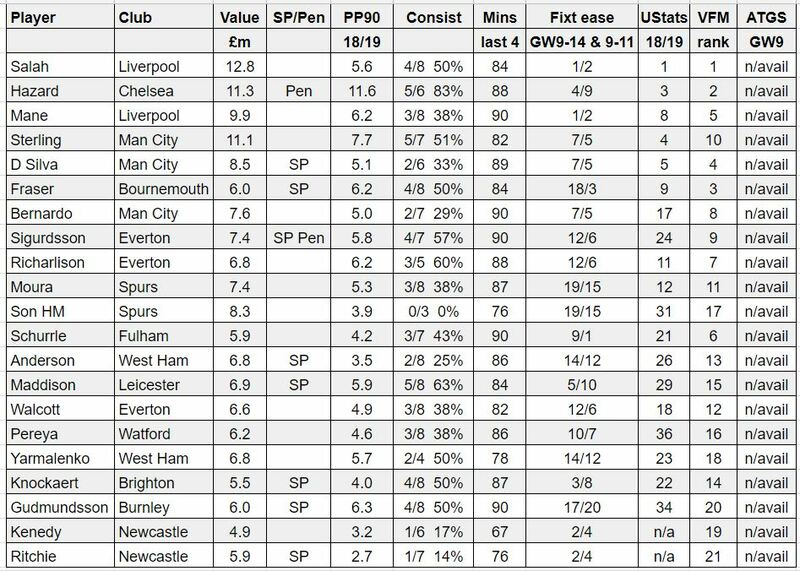 There’s a table of stats to help you make a transfer choice. This is the 2nd article in our player rankings series. See the defender and GK player rankings article. I’ve started with a selection of midfielders that I think will start GW9 and have some longevity in the team. I’ve then looked at their expected goals and assists data in 18/19 so far as well as how it relates to their historical numbers. I’ve then adjusted it for their ability to over/underperform, their bonus potential, their fixtures over the next 6 and any specific 18/19 factors and numbers. Mins last 4: average minutes of the last 4 matches. Generally I count sub appearances or rotation but not injury absences although there is some discretion there. VFM rank. I have divided their projected points by their price to get a rough value for money assessment. This time it just ranks them in relation to each other. 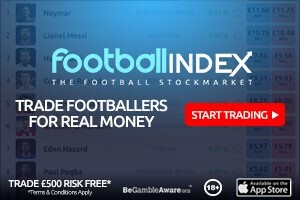 ATGS GW8 – 1 bookies anytime goalscoring odds for the player. It assumes they start and doesn’t include assist potential. However it’s too early for their to be odds at the moment so I’ll update it later. Player values are as of Thursday 11 October. Salah appears to become pretty tentative with his finishing but he’s producing underlying stats at an even better rate than last season and his previous history doesn’t show any inability to finish off chances. That plus the fixtures are the reason why he’s so highly ranked. David Silva and Bernardo have some gametime risk around them associated with the return of De Bruyne. Sane and Mahrez seem to have too much gametime risk to be in the schedule. I’ve stayed away from Arsenal as who knows what selection will come out next after the Fulham team sheet. Similarly for Man Utd although I could have put Pogba in retrospect even with his deep lying position v Newcastle. I’ve left Willian off as I’m still a little wary on the him v Pedro selection question. I think £5.0m Brooks of Bournemouth and £4.8m Murphy of Cardiff have some potential but they’re very hard to model given were so few games in and they’re both so new. your thoughts on getting Brighton mids and defs in ?? Are there any updates/thoughts on De Bruyne? I know he started training again starting Oct. 1st. Is there any chance he plays in Week 9 or is it safe to say it will be another week or so?